I have been searching around for an alternative source of income, especially from the internet. I must have place my email address somehow in some website and received and email for an invitation to preview a World Internet Secret seminar in Armada Hotel organized by Success Resources Sdn Bhd. I almost deleted the email because I thought it was just spam but noticed that the email originated from Malaysia. Curious, I open the mail and read through what they have to say. Needless to say my interest was aroused because the topic was about making an income online. Well, my current Cameron Highlands website is not doing too well, though it did earn some for extra pocket money, but not enough to live off it. Either my niche was too small or my monetizing model was not too good. So I needed to look for an alternative source of income. It was a Monday evening and I went by over to Armada Hotel after having my dinner at McDonalds. Well there weren’t many choices of food during evening around my office area. But still, it was a quick and easy meal for me. Arriving at the conference hall, I found the reception jam packed with participants. Eavesdropping on some of their conversation, I found out they are mostly from the IT background. There were also many entrepreneurs and budding entrepreneurs too. All curious to find out what’s all this was about. I tried to mix around a bit though I’m not much of a social person, however networking with people would be good. Never know I might get some opportunity. After all there are so many people who started off their own business. Might good to exchange some info and possibly get some ideas as well. One that looked interesting was a work at home business selling a weight loss program. It seems the guy, Eugene an ex-IT specialist has decided to call it quits with the late night fixing of IT systems whenever it goes down. He had quite enough of the late night hours and started this weight loss business some seven months ago. In just a few short months he has made a sufficient income to quit his job. Hmmm… will have to look into this idea later. Yet another person, a Ms Alice Chua, who is selling some subliminal self improvement audio CDs and seems to be doing quite well for herself. Her partner has asked her to check out what all this internet business was all about and see whether it can be incorporated into their present sales system. I should have mixed around more, but time was up and we were all ushered into the conference hall. After some brief intro by one of the staff from Success Resources, a Johan Mok took the stage and started explaining about the internet and how he made his money from it. He had some humble beginnings and of course faltered and made mistakes losing much money initially. But eventually after hooking up with some internet gurus he found a monetizing model that up till today gave him lots of passive income. What he explained open up my eyes and now I can understand how all those hyped up websites with only one or two webpages with very long explanation that actually sells the products and makes money! I always though those sites were too scammy using such hard selling tactics. It turns out to be based on a direct response marketing strategy where the visitor either do or don’t buy the product. In this case, content is not king. It doesn’t need content to sell. They are selling content instead of using content for pre-selling and warming up to potential prospects. Very different approach from that of Site Build It!. If they can really do it, I think I could too. But like all money making schemes, it requires some work and understanding of how the internet works. The tools are scattered all over the net, and it might take a newbie some time to comprehend how to do it. And from the questions that was raised from the floor, I think practically I would say most of them are pretty newbie. 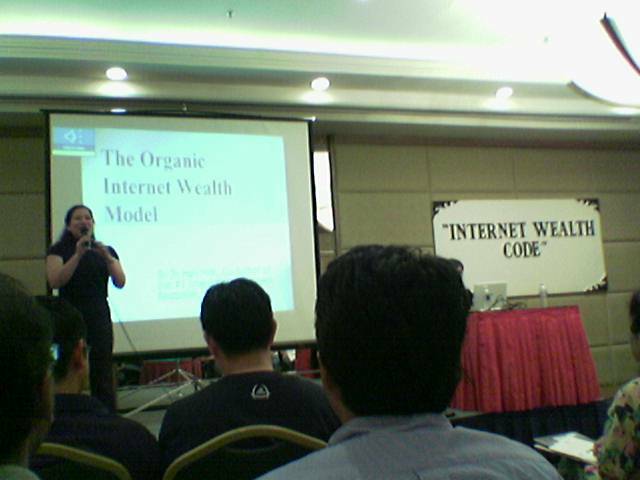 I not sure whether the next conference, The Internet Wealth Code Seminar held on the 16th (Fri) & 17th (Sat) which I have to pay RM850 to sign up would be a good investment for the knowledge derived or not. But at least I feel there seems to be a direction somewhere for me right now. Or am I a sucker to fall for the sales pitch and pay such a price for such a conference? And now that I know roughly how they did it; I started to download whatever stuff that at this moment was offered free for attending this seminar to just to have some insight into their mechanization as to how they do it. Maybe it is a good starting point. I guess I’ll start with a modest target and see what happens. Looks like a lot of work involved but the idea of never having to look over my shoulder at my boss breathing down my neck and trying to deal with those complaints from customer who are having quality issues with our products and making all those cold calls which I feel it is the most ineffective way of getting a sales lead… sigh! Until I get the right formula I will have to bear with it. There is still hope for me yet! Never give up, because persistence and tenacity will get you what you want and that’s how I shall go about it!